urbanbaby&toddler magazine: Perfect for Whole Family: Kids Playce at Playland! Perfect for Whole Family: Kids Playce at Playland! Saturday May 5th 2016 was a perfect day to go to Playland - especially since it was the fun filled playpark’s opening weekend of the season! The sun was shining, the weather was perfect - warm and sweetly fragrant with cherry blossoms and lilac, so reminiscent of a perfect Spring Vancouver day. And what a great day to hit up playland for opening day. We headed downtown early and immediately spotted the classic coaster on the horizon, which we excitedly pointed out to the kids as we cruised up Hastings towards the park gates. My kids and I had been counting down the days until Playland for several weeks, so as we approached the front gates, to say they were excited is an understatement. We arrived around 11am and walked right through the front gates, pleasantly surprised that there weren’t many people there yet. In fact, we walked onto almost every ride!! What a concept with 2 kids under 5 that don’t always have the utmost of patience. Once we were in the front gates we excitedly headed to the Kids Playce where the kids chose their first ride of the day – the Cool Cruzers! My girls immediately chose the “pink sparkly car” to ride in. They loved it so much that they actually went on the ride 3 times consecutively. KC’s Raceway, which is another car ride that winds along a real race track! This is such a great ride for the young ones because it makes the kiddies think that they’re actually steering and driving a real car! There are shiny punch buggies, cool jeeps and glittery convertibles, all chasing each other around the track. My girls had such a blast on the Cool Cruzers that they next had to try out their skills on KC's Raceway, which is another car ride that winds along a real race track! Our next choice was the Teacups Ride. I’m pretty certain that my kids thought we were in Disneyland for this one! This is a fairly new ride at Playland – Est 2013 – and it’s just as dizzy and fantastic as the one in California! The cups spin around fast or slow depending on how you steer the wheel in the middle of the cup, and I couldn’t help but laugh at my 2 year old’s face as the cup gathered speed around the corners! Next up – the Honeybee Express! This is a great little train for kids and families of all ages. 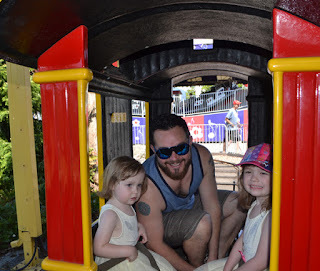 My girls immediately headed to the caboose and were all smiles as we wound around the enchanted forest. After the choo choo ride of the Honeybee Express, we headed over to KC’s Explorers, which are super cute pirate ships that float along in water. I loved the striped pirate flags and my girls loved the fact that they thought they were actually sailing on the open sea. Since my little ones are still a bit timid, we opted out of the Kettle Creek Mine Coaster and the Balloon Explorers, but these two rides are by far two of the coolest looking rides in the Kids Playce – and the bonus is that you only have to be 42” and 36” tall to ride them (respectively). And let’s not forget my fave as a kid – the Choppers, a fun motorcycle ride under a flame-decorated awning – and the Merry Go Round, a traditional family fave. At this point we had really worked up an appetite so we headed on over to White Spot, the traditional and most popular place to grab a burger and fries in the park, and we filled up before heading to get some yummy cotton candy and to try our luck at the midway! Midway was the highlight of the day. Daddy showed off his skills and immediately popped 3 balloons, winning both girls a shopkins plush - what a success! After several fun filled hours of rides, treats and fun, we headed back to our car with our bellies full of cotton candy and smiles on our faces. What a wonderful day at Playland! Playland is now open from May 7th - June 26th (Saturdays & Sundays till June 17) from 10am-6pm. For general information and ticket prices check out PlayLand at the PNE. Reminder: Children 3 & under receive free admission to Playland. For information and height requirements on all rides check out Kids Playce at Playland.